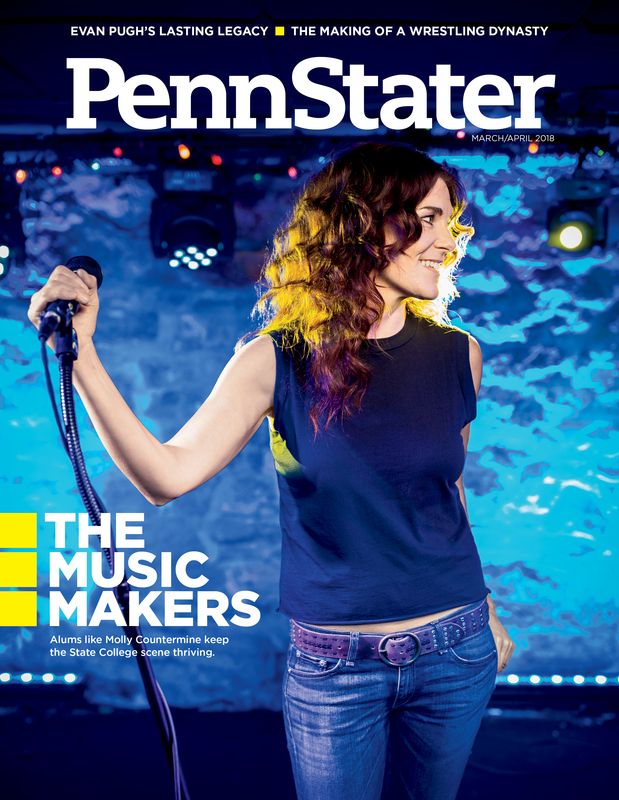 Many alums will no doubt be reminiscing about the first time they saw the Phyrst Phamily, late nights at Café 210 West, or memories of the recently closed Rathskeller when our March/April issue arrives. The nostalgia comes in the form of Penn State alumni who are a part of the Happy Valley music scene. We catch up with a number of local musicians and bands, some of whom arrived on the scene relatively recently, and others whom your parents might have seen. The photo feature starts on p. 40. We also take a look at how Cael Sanderson has turned Penn State into the nation’s most formidable collegiate wrestling program. Former ESPN reporter Dana O’Neil ’90 profiles Cael Sanderson to explore what drives his sustained success. And a new book by Roger Williams ’73, ’75g, ’88g chronicles the life and legacy of Evan Pugh, Penn State’s first president. You’ll also meet Kurt Gibble, the Penn State scientist who’s trying to make the world’s most accurate clocks even more precise; learn from nutrition professor Penny Kris-Etherton which  “good” fats your body needs; and find out why nursing students sometimes wear scrubs to classes. It’s all in our March/April issue, arriving in mailboxes this week. Entry filed under: The Penn Stater Magazine. Tags: March/April 2018.